How businesses get started, skill-up, and achieve scale for their AI projects. Australian household brands, including ANZ Bank, nib healthfunds, and Airtasker, are just some of a few organisations who have successfully shifted from experimentation and into live production use cases using machine learning, deep learning, chatbots or robotic process automation. 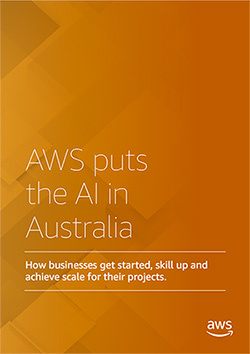 Find out in our succinct and insightful report, AWS puts the AI in Australia, how industry leaders are using Cloud and AI to elevate employee and customer experiences and accelerate their adoption and realisation of value by focusing on three key things: Get started, Get skilled, and Get scale.